On this date in our family history . . . the 17th day of January . . . in the year 1996 . . . following a brief battle with kidney cancer . . . my Dad, Forrest Lee Pounders, died in Rockdale, Texas . . . he was laid to rest in a little country cemetery in central Texas . 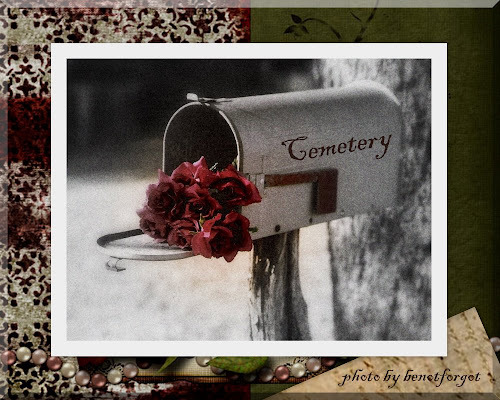 . . and this mailbox actually stood in that cemetery at that time . . . as if awaiting a letter addressed to one of the residents . . . Dad had delivered mail in Rockdale for many years (go take a look at his grave marker) . . . I snapped this photo shortly after his death . . . the flowers were for his grave. . . .
On this date in our family history . . . the 16th day of January . . . in the year 1864 . . . in Houston County, Texas . . . Mary Alexandrien (Nellie) SHARP nee LEMAIRE (my 2nd great-grandma) has a miscarriage while her husband, Sam, is still in jail (see yesterday's post) . . . this is one of those facts of life that would be completely unknown to those of us who are Nellie's descendants were it not for the following entry from the daily Journal of Nellie's husband's step-brother / brother-in-law, James Madison Hall (1819-1866) . 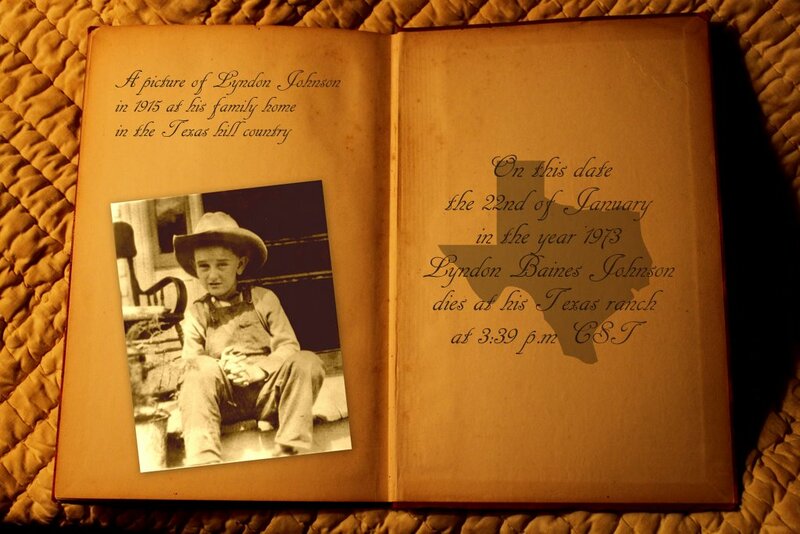 . .
Saturday, January 16th, 1864. Today I am still in Crockett and Sam is still in confinement and as I said in yesterday's notes on no charge but mere suspicion that he is liable to conscription. The reign of Military despotican is now complete, and a man not in the Army dares not say that his life is his own or that he owned one dollars worth of property. I left Crockett late in the evening after having failed to obtain Sam's release. upon my arrival at home I found as I have previously expected that Nellie had miscarried. this catastrophy was hastened by the cruel and hostal arrest of her husband. If the agents of the Government think this is the proper way to make good soldiers for its armies by dragging husbands from wives who are almost at the point of death, I must humbly beg leave to differ with them. Dr. Murchison and Mother [Mahala Sharp Hall nee Roberts] were in attendance upon Nellie. at night Sam came home to see his wife having been released upon his parole to return on Monday night. Dr. Murchison & Mother remained all night. . . .
On this date in our extended family history . . . the 16th day of January . . . in the year 1913 . . . Judge E.L. Antony dies in Dallas, Texas . . . this Judge Antony is a 1st cousin 3 times removed to the Keeper of this family history blog . . .
Judge E.L. Antony of Cameron, Tex., a prominent Texan and former Congressman, died yesterday morning at the residence of his brother-in-law [sic -- actually son-in-law], L.C. McBride, 3304 McKinney avenue. Judge Antony was born in Burk County, Georgia, Jan. 5, 1852. His parents were Dr. Milton Antony Jr. and Margaret Frances Davis. Dr. Milton Antony, the grandfather, was the founder of the Medical College of Georgia at Augusta. The ancestors of Judge Antony were of the old Virginia Commonwealth, who bore valiant part in wresting the thirteen colonies from the dominion of Great Britain. He came with his parents to Texas in 1859, settling at Columbia, Brazos [sic -- Brazoria] County. In 1869, he entered the University of Georgia (formerly Franklin College), where he graduated with honors in 1873. During these four college years he was closely associated with two of Georgia's gifted sons, Charles Crisp and the immortal Grady. Returning to Texas in 1873, he was admitted to the practice of law at Cameron, Milam County, where he married Miss Augusta Houghton, Sept. 20, 1876. He was conspicuous in many ways, serving his people in various capacities. He was elected to Congress to fill the vacancy caused by the appointment of Roger Q. Mills to the United States Senate, which he filled with distinction and credit to himself and his constituents. His many friends will concur in the statement that no Representative of the people ever had a clearer view or more powerful conception and grasp of the tariff question than did he. He was a man of much and varied learning, not only as a lawyer, but in the many fields of literature and science; many sided, and much gifted, it was easy for him to do what seemed hard and difficult to most men. He is survived by his mother, Mrs. Margaret Antony, now in her eightieth year; a wife, and two daughters, Miss Beryl , and Alice, the wife of J.A. Brown, all of Cameron, Tex. Funeral services will be held at the home of Mr. McBride, at 2:30 o'clock this afternoon, by Rev. J.H. Moore, and the burial will be in Oakland Cemetery. The following have been selected as the active pallbearers: Murphy W. Townsend, Cullen F. Thomas, A.H. Winkler, C.H. Loper, O.F. Wencker and W.P. Donaldson, and the following as honorary pallbearers: Judge E.B. Muse, Judge Kenneth Foree, Judge J.E. Cockrell, E.W. Luna, F.R. Malone and J. Howard Ardrey. 100-year-old 1911 Calendar Postcard from private collection of benotforgot . . . and you are welcome to save a copy of this for your own personal use . . .
One hundred years ago today . . . on the 1st day of January . 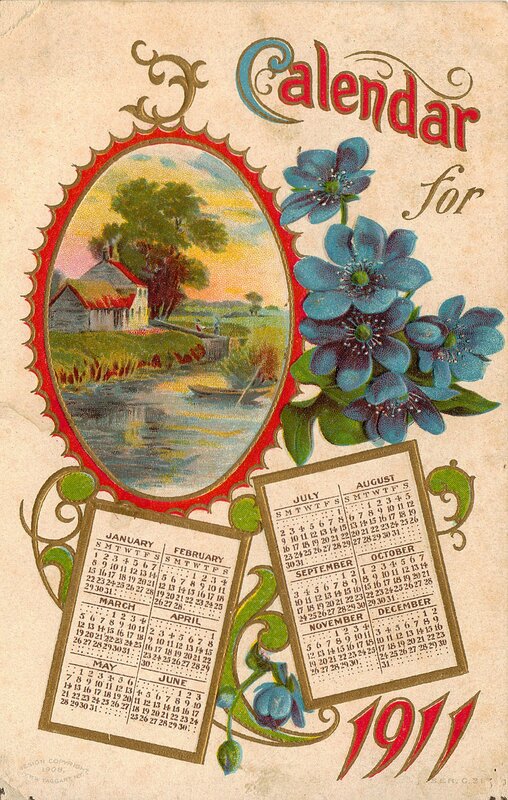 . . in the year 1911 . . . I wonder . . . were our ancestors recalling the events of the year 1910 . . . and at the same time wondering what the coming year would bring in their lives . . . three of my grandparents were born during the first decade of the 20th century (one grandma would not be born until 1912) . 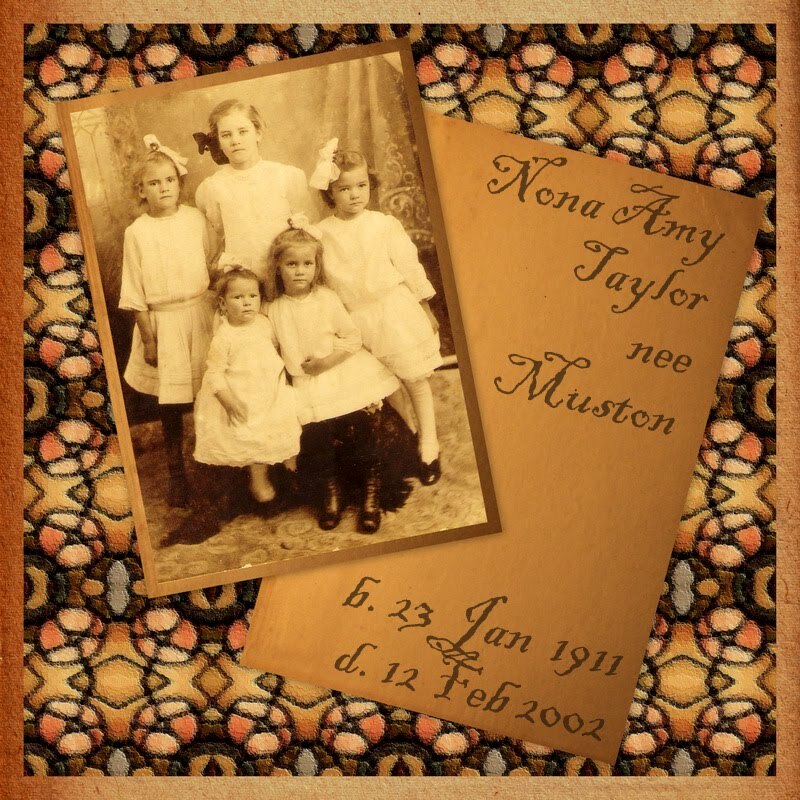 . . all eight of my great-grandparents were alive at that time . . . but only six of my sixteen 2nd great-grandparents are known to have still been living as of the 1st of January in 1911 . . .
One hundred years later . . . on the 1st day of January . . . in the year 2011 . . . 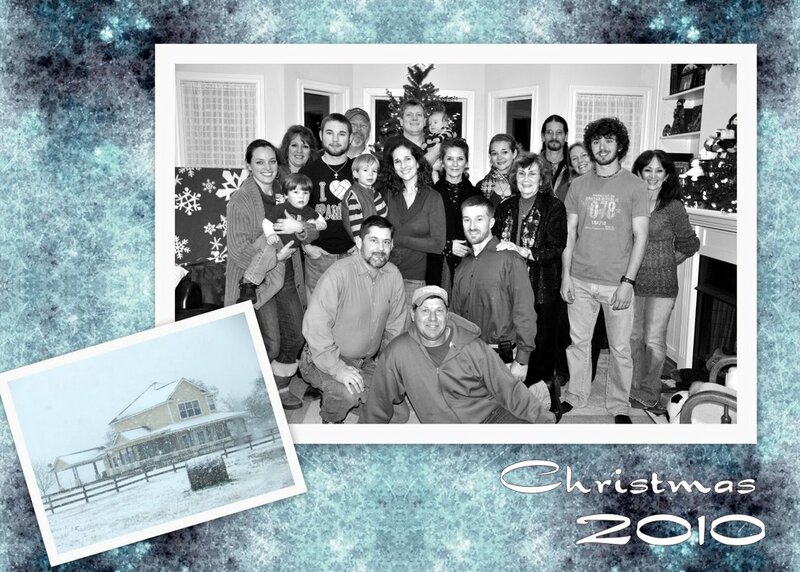 I am so very blessed and thankful for my family (L-U-V y'all) . . . for my health (and that's a big one) . . . for a warm roof over my head . . . for dear friends who actually know what it means to walk the talk . . . for a God who loves me and has collected all my tears in a bottle (and there have been a lot of them since the 7th day of April) . . .
On a lighter note . . . I am also thankful for my constant companion and foot-warmer, Riley (Bennie's poodle) . . . and for the new toys I received for Christmas . . . one being a new Canon EOS Rebel D-SLR camera (Bennie always enjoyed giving me tech gadgets for gifts . . . so this was a gift to myself, a long-needed upgrade from our original vintage Canon AE-1) . . . but the best gift (mostly because of the thoughtfulness and love behind it) I received (besides time spent with family) was the Flip-Pal Mobile Scanner my family surprised me with . . . we do what I will refer to as (because our Mom was born in Massachusetts) a Yankee Swap . . . so there are not supposed to be any exchanges of gifts between individuals . . . my baby sister (who was the instigator on this little project) told me the surpise gift was to show appreciation for all the work I've done on gathering and sharing our family history . . . [note to self . . . be careful about entering those contests on facebook . . . some family members actually read that stuff!!!] . . . sooo . . . Most of the following items have been on my mental to-do list for a while . . . but only because Jasia has challenged us to commit to some genealogy goals in 2011 for her 101st Carnival of Genealogy . . . (and with the qualifier used by my 2nd great-grand-uncle almost 150 years ago . . . whether God will permit me to live, to keep the records of another year, is more than poor mortal man can know, but trusting in His mercy I shall enter upon the trials of another year, with hopes of future success & prosperity through His goodness & favor.) . . . I am stating to whoever is listening that . . . the good Lord willing and the creeks don't rise . . . I plan to keep on keeping on . . . with the daily postings at The Journal and On This Date . . . and an occasional family-related quote at And I Quote . . . and getting together some new posts here at benotforgot.com . . . and continuing to transfer info from an expired rockdale.myfamily.com to Rockdale - My Hometown . . . and figuring out how to stay organized once I actually get organized (i.e., putting photos, books, files back where they belong instead of in convenient stacks and piles around my computer area) . . . and consistently paying attention to the reminders to do backups . . . and to learn to use the new toys (camera and portable scanner)!!! . . . and to use that camera when visiting cemeteries and photographing grave markers and then posting them on findagrave (with appropriate genealogical info) . . . and to use that portable scanner when I do onsite research at various libraries and research centers in Texas, as well as on visits to family members throughout Texas . . . AND . . . to research and shop for a new desktop computer (had a power surge that may have killed the old desktop . . . awaiting a final diagnosis from the nephew-in-law / IT guy) . . . and then purchase and install Family Tree Maker 2011 and learn to use it (having some issues with FTM 2010) . . . whew . . . I'm exhausted already . . .